The session will describe the factors involved in taking a business decision to use Cloud Computing, based on The Open Group's recently-published book "Cloud Computing For Business". 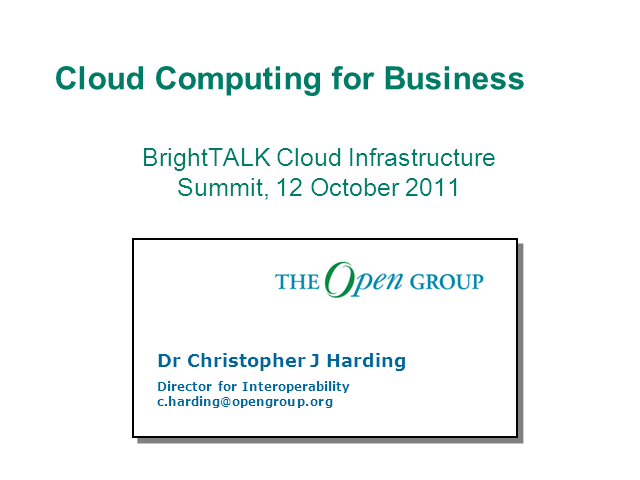 Cloud Computing is not a "one size fits all" solution. For each situation, you must determine whether Cloud is the right approach and what is the right size and shape of Cloud to use. The starting point is a vision of how the technical possibilities of Cloud can solve a business problem or help you take advantage of a business opportunity. You then assess the risks and estimate the return, decide on your Cloud solution, put it in place, and monitor the results. - how to measure and develop the return on investment in Cloud.